As I posted about in Dear Kid Saturday: Selective Vegetarianism, NHL recently tried to get out of eating a hamburger by claiming that he doesn’t eat animals that he likes. Apparently, he is a big fan of cows because they give us milk. Chickens, on the other hand, have fallen out of favor with NHL and onto his plate. My Aloha Question for the day is: What culinary excuses have your kids employed to get out of eating their breakfast, lunch or dinner? No kiddos here, but my brother use to say beans made his ears itch. My daughter just says.. she is not hungry.. but my you wouldn’t know it! she is not a morning person. Lol I like his thinking only eating animals he doesn’t like, I’ve been vegetarian for over 10 years, and my Mum thought that was just a fad i’d grow out of! My daughter is too young to give excuses, so I can’t really say. But I can tell you that when I was younger, I wasn’t a big fan of chicken and tried telling my mom that I wanted to be a vegetarian (mostly I think because I didn’t want to eat it). I think I was told fine than make your own food. I continued eating chicken and other meat until 16 (when I did start making my own dinners). 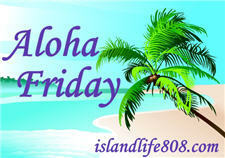 Jolly Green Mommy recently posted..Aloha Friday #3? My toddler says something is too salty or too hot when he doesn’t want to eat it. Even if it is cold and sweet! Owen’s Mom recently posted..Giveaway Winners! Well I have no kids, but I am pretty sure I have heard my hubby say he can’t eat unless it comes from the drive through!